Defence firm Babcock has been awarded a £350 million contract by the UK MoD to conduct a three-and-a-half year refit of the Trident missile carrying submarine HMS Vengeance. The work which will commence at Babcock’s Devonport Royal Dockyard involves fitting the submarine with a new reactor core as well as tactical and strategic weapons system upgrades, surveys, hull & structure preservation and an overhaul of all the submarine’s major components, systems and equipment. HMS Vanguard is the fourth and last of the Vanguard class submarines to undergo a Long Overhaul Period and Refuel (LOP(R)). Work also includes the installation of main static converters to replace the high maintenance motor generators, a significant instrumentation upgrade and upgrades to the tactical combat systems. The submarine is aqlready at Devonport ready to dock later this month and will remain in dry dock until flood up in late 2014. Babcock Managing Director Submarines, Mike Homer said that the contract builds positively on the previous contract for HMSVigilant. "I cannot over emphasise the benefits achieved via the joint partnering ethos, that places delivering to meet the customer’s needs as the utmost priority for all parties involved – including the customer’s own team who have a vital role in soliciting inputs and decisions from the wider MoD, Royal Navy and stakeholder community, and for all parties to proactively engage on finding resolutions for complex technical issues," Homer said. A statement from Minister of Defence Phillip Hammond said that work on the Vanguard class vessel will secure 1,000 jobs at Babcock, 300 at other firms in Plymouth, and 700 elsewhere. 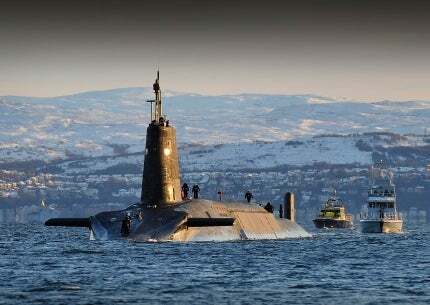 "As well as securing 2,000 UK jobs, this contract will ensure the nuclear deterrent submarine fleet can continue to operate safely and effectively to maintain a continuous at-sea deterrent," Hammond said. According to Babcock the programme will involve over 2.5 million manhours and over 2,000 personnel across the supply chain, including 1,000 Babcock personnel and 300 local subcontractors. Photo: The £350 million contract will see the refit of a new nuclear core expected to last the submarine until decomissioning.